The present study was based on assessments of the antiparasitic activities to determine the efficacies of leaf hexane, chloroform, ethyl acetate, acetone and methanol extracts of Aegle marmelos (Linn.) Correa ex Roxb, Andrographis lineata Wallich ex Nees., Andrographis paniculata (Burm.f.) Wallich ex Nees., Cocculus hirsutus (L.) Diels, Eclipta prostrata L., and Tagetes erecta L. against the adult cattle tick Haemaphysalis bispinosa Neumann 1897 (Acarina: Ixodidae), the larvae of Rhipicephalus (Boophilus) microplus Canestrini 1887 (Acari: Ixodidae) and sheep fluke Paramphistomum cervi Zeder 1790 (Digenea: Paramphistomatidae). All plant extracts showed moderate toxic effect on parasites after 24 h of exposure; however, the highest parasitic activity was found in leaf ethyl acetate extract of A. lineata, methanol extract of A. marmelos, A. paniculata, and C. hirsutus against H. bispinosa (LC50 = 395.27, 358.45, 327.21 and 420.50 ppm); ethyl acetate extract of A. paniculata, C. hirsutus, methanol extracts of A. marmelos, A. lineata, and E. prostrata against the larvae of R. microplus (LC50 = 207.70, 258.61, 134.09, 206.00, and 274.33 ppm); hexane extract of A. lineata, ethyl acetate extract of A. paniculata, E. prostrata, acetone extracts of T. erecta, methanol extracts of A. marmelos and C. hirsutus against P. cervi (LC50 = 254.23, 451.17, 425.73, 253.60, 542.71, and 360.17 ppm), respectively. The present study is the first report on the veterinary parasitic activity of plant extracts from Southern India. The authors are grateful to C. Abdul Hakeem College Management, Dr. S. Mohammed Yousuff, Principal, Dr. K. Abdul Subhan, HOD of Zoology Department for their help and suggestion. 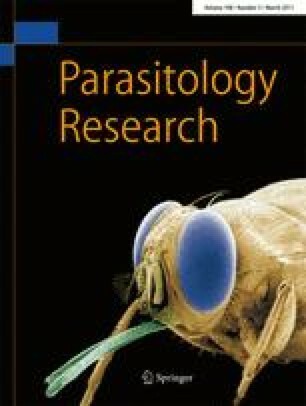 The authors wish to thank Dr. A. Sangaran, Department of Parasitology, Madras Veterinary College, Tamil Nadu Veterinary and Animal Sciences University, Chennai, India for identification of parasites.